I love this concept of being in the flow, coming across it when I attended our Accelerated Executive Presence (AEP) program a few years ago. For me it was new stuff, the moment when I learnt why there were some days when I was oblivious to time. I had always been more aware of the opposite – when everything just takes forever. You may be on a simple plane trip, Melbourne to Sydney, it’s a quick 90 minutes. You’re compressed either side by fellow travelers also just trying to keep their elbows the polite side of the divider, but you’re wriggling in your seat thinking, the plane is never going to land and you just need to stand up and get out of there, now! 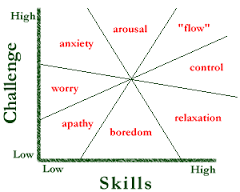 It was revealed to me as Flow: The Psychology of Optimal Experience. Flash huh, but Dr Mike Csíkszentmihályi (yes that’s his name) outlines his theory that people are most happy when they are in a state of Flow – a state of concentration or complete absorption with the activity at hand and the situation. The idea of flow is identical to the feeling of being in the zone or in the groove. He described the flow as “being completely involved in an activity for its own sake. The ego falls away. Time flies. Every action, movement, and thought follows inevitably from the previous one. Your whole being is involved, and you’re using your skills to the utmost.” He goes on to explain that to achieve a flow state, a balance must be struck between the challenge of the task and the skill of the performer. If the task is too easy or too difficult, flow cannot occur. Both skill level and challenge level must be matched and high; if skill and challenge are low and matched, then apathy results. In short, flow could be described as a state where attention, motivation, and the situation meet, resulting in a kind of productive harmony or feedback. Now I think about it all the time, especially as a program facilitator. I spend a significant chunk of my time making sure the design of the program is right, the learning outcomes and action learning approaches sorted out and carefully built into the session. This is your insurance that if it all goes to plan, you get through the content meet your learning outcomes and that’s good? Yes? But now, while I still do all that, what I hope for and what I seek out is the energy, my version of the flow. When you’re with a group for one or even five days it’s being aware of the opportunity when it presents itself to get them completely involved in the moment. I just sense a change, it’s a in the lift of energy in the room, or when things fall awkwardly silent, so you know that something is presenting itself. Imagine it like your back on that same plane, you’ve landed and there is a soft fullness in your ear, on the way down the change in pressure forced several small soft buds of cotton wool into your ear and they are not budging. You stick a finger in your ear and jiggle it around, nothing, you blow your nose, nothing, and you blow your nose again, nothing. Then you swallow, eat a mint, hold your nose and blow again, you shake your head, nothing, nothing, nothing and nothing. You then wait, for experience tells you that it will occur, the moment when there is a burst, a break, a pop and then – you can hear all manner of things. This is like how it is when you discover flow – there is energy – this you must follow. Firstly it’s to be aware of when you are in the flow, what it feels like for you and learn to enjoy it. How better to spend time than being completely absorbed in the task and you feel like you have it in hand. Secondly would be to learn to live with the times between and fill them with the “stuff” that makes the machine work, doing your expenses, filling out the forms, responding to your emails. The easiest was I find to do this is to only give them the slice of time they deserve. Thirdly is the mother of all challenges – how do I take a group into the flow with me? My advice is to create the right environment for the energy to fill the room, and this includes picking the right reason to work on something. What are the hot topics of conversation good and not so good, and pick something that captures attention. Then create a case for things to be different, if the payoffs for the change don’t outweigh the costs of what I need to give up, why would I be motivated to do the work. Finally create the situation where it can flow; be flexible, reset your expectations of what you want to achieve in the time you have set aside and just let it happen. Don’t get me wrong, never let your plane be hijacked by individual agenda’s or powerful politics, but as being in the flow implies, the matching of skill and challenge, then you will know when this is not happening, and you can do what you can shut it down, and move back towards the flow.